Texas is a diverse state with an array of things to do, from wine country escapes, unique castles, lakes, sandy beaches and romantic getaways to family Texas vacations, fun day trips and coastal spots. Unwind in a natural setting while exploring a new destination like Corpus Christi, South Padre Island, Fredericksburg or Plano. The Tremont House in Galveston is a romantic trip idea from Houston, offering couples a great base for exploring the attractions and the beaches in the area. Guest rooms and suites feature high ceilings, hardwood floors and custom period furnishings. Luxury amenities include HD television with premium channels, free Wi-Fi, an iPod docking and Wolfgang Puck Coffee. Celebrate a special occasion in style by booking the spacious Belmont Suite which has a separate living area, wet bar and romantic plantation shutters. Lake Austin Spa Resort is a romantic luxury getaway located on 19 lakefront acres 30 minutes from Austin. The resort offers all-inclusive spa packages that range from three to seven nights in length, and is one of the top girlfriend getaways in Texas. You can get away for a long weekend, or enjoy an extended stay. The atmosphere is relaxed and intimate since there are only 40 guest cottages. Exuding an elegant and classical charm in historic downtown Brenham, Texas, the Ant Street Inn is a comfortable sanctuary and perfect base from which to explore the town. Rich oriental rugs, stained glass and exquisite antique furnishings create havens of tranquility in each of the fifteen beautifully appointed guestrooms in the hotel. Guests enjoy lovely en-suite bathrooms with deluxe bath products, individual climate control, flat screen televisions, and high-speed wireless Internet throughout the hotel. In the morning, a delicious made-to-order breakfast is served at the Brenham Grill. The large verandah overlooking the gardens behind the hotel is the perfect place to relax with a coffee. Situated in the middle of historic downtown Brenham, there is much to see and do just steps from the hotel. Taste award-winning homemade ice cream at the Blue Bell Creamery or sip wine at one of the outstanding Washington County wineries in the area. Rooms start at $150 per night. The Inn on Lake Granbury is a romantic lakeside retreat with 15 guest rooms, a saltwater pool, waterfall and lush grounds. You will be just a couple of blocks from downtown Granbury where you will find unique shops, restaurants and a live theater. Ask for a room with a stone fireplace, jetted tub and a balcony on your romantic weekend getaway. The suites on the west side have the best lake views and more contemporary decor. Two of the suites have a spiral staircase that leads up to a sitting area. Nearby activities include golf, boating, kayaking, hiking, wine tasting and biking. Rooms at the Inn on Lake Granbury start at $215; suites from $285, including full breakfast and afternoon appetizers. Browse weekend getaways from Dallas. 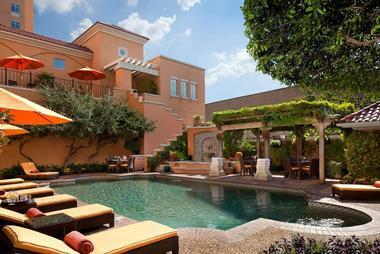 Omni Barton Creek Resort & Spa is a golf getaway located in the Texas Hill Country, 15 minutes west of downtown Austin. If you are looking for Texas vacations for golfers, this is a great place to visit. There are four championship golf courses, a tennis center and a spa. Fazio Foothills, Barton Creek's signature golf course was designed by Tom Fazio. Along the way, you will see waterfalls, cliffs and natural caves. The newest course, Fazio Canyons, offers many scenic holes with trees. Located two miles from the resort's main clubhouse, it has its own pro shop and practice areas where you can improve your game on your golf trip. Lakeside golf course, 25 miles west of the resort, features panoramic lake views. It was designed by Arnold Palmer and opened for play in 1986. The fourth golf course, Crenshaw Cliffside Course, was designed by Ben Crenshaw. All four courses have been recognized for their commitment to the environment and have achieved designation as a Certified Audubon Sanctuary System. After a round of golf, get pampered at the Spa & Fitness Center. Services offered include Swedish massage with aromatherapy, therapeutic sports massage, self-heating marine mud, French seaweed treatment and facials. Guests can get a massage at one of the private massage studios. The indoor pool is designed for individual and group aquatic activities. There is also a full service beauty salon. There are 12 outdoor tennis courts, 10 with lights for night play. Guests can relax next to the new outdoor resort pool or walk the 1/2 mile Nature Trail. The Kid's Club offers activities for children, including arts and crafts, sports and board games. The 295 guestrooms are furnished in regional style. Sixteen suites offer expansive views of the Texas Hill Country and the golf courses. 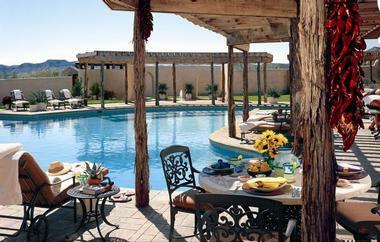 The resort offers tasty Southwestern cuisine as well as low-fat options for the health conscious. Spring and fall offer warm weather and mild temperatures, perfect for a round of golf. Hotel Derek is a stylish getaway in Houston. The hotel is located in the uptown Galleria area at the intersection of Westheimer and West Loop 610 South. fter a day of sightseeing, relax next to the outdoor pool, get a spa treatment or work out in the 24-hour fitness center. There are 314 guest rooms including 10 generous suites and 16 business studio rooms. Rooms feature cowhide rugs, English wingback chairs, pinstriped duvets, and soothing earth tones. High-speed Internet access, voice mail, and in-room FedEx supplies are several of the amenities designed to appeal to the business traveler. Three Robert Trent Jones Sr. golf courses, three pools, a marina, tennis courts, a luxury spa and numerous gourmet dining options ensure that guests of Horseshoe Bay Resort in Texas can enjoy a wide range of activities during their stay. The property has three different pools to relax by as well as one of the world's largest adult whirlpools. If you are looking for some adventure on the water, rent a runabout, ski boat, pontoon boat or a wave runner at the Marina. Ram Rock, Apple Rock and Slick Rock are the three Robert Trent Jones Sr.-designed courses. If you prefer tennis, then you can play on clay, hard, or even grass courts. The property has 349 rooms each with two phone lines, high-speed Internet access, coffee maker and tea service, refrigerator, and panoramic views of the surrounding Hill Country and Lake LBJ in Texas. Sleep comfortably on Marriott's newly designed beds with plush pillows and duvet covers. Dining options include Lantana Bar & Grill, Highlands Bar and the Poolside Grill & Bar. Dishes at the Lantana are prepared over an open flame in the exhibition-style kitchen, mixing fire and spice. The restaurant also has chef's tables and two private dining rooms, including a wine room. For golfers the main attraction at the resort are its three Robert Trent Jones Sr.-designed golf courses. The Slick Rock course, built in 1971, is a 6,834-yard-long par-72 course. The 14,000-square-foot clubhouse is located on this course. The Ram Rock course, built in 1981, has narrow fairways, 62 deep sand traps and water hazards on 10 holes. The Apple Rock course was completed in 1986 and has views of the lake. If you need to improve your putting, head to the Whitewater Putting Course and Adventure Park. The Putting Course is billed as the most expensive 18-hole putting course in the country. The course is surrounded by rose gardens, fitness trail and outdoor entertainment pavilion. The property is approximately 60 miles from Austin and 85 miles from San Antonio. If you fly into either Austin or San Antonio, you can drive or arrange for a shuttle to meet you at the airport. If you happen to own your own plane, the hotel has a private runway that you can land on and be on the course in minutes. Rates start at around $219 per night. Rosewood Mansion on Turtle Creek in Dallas is a luxury hotel with an elegant lobby, spacious rooms and central location near the American Airlines Center and the Dallas Museum of Art. If you are looking for luxury city vacations, with a 2-to-1 staff-to-guest ratio, this getaway provides prompt service and attention to detail. Guests enter through a 32-foot-high marble rotunda complete with a beautiful floral arrangement. The lobby features antiques, lounge chairs and sofas arranged around the fireplace. The nine-story building has 143 custom furnished guest rooms and luxury suites featuring antiques, fine fabrics and original works of art. Guest rooms measure 450-square feet in size and offer a sitting area, large closet, marble bath and separate vanity. Custom bath amenities were created exclusively for the hotel. There is a fitness studio, a salon and a business center. The outdoor swimming pool is heated during the colder months and has a poolside bar in the summer. Guests receive offers a complimentary sedan service within a five-mile radius. The restaurant, housed in the 10,000 square foot Sheppard King Mansion, serves Southwestern cuisine for lunch and dinner. The restaurants includes a main dining room with an enclosed veranda as well as several intimate private dining areas if you want to celebrate a special occasion on your luxury city vacation. Alternatively, guests can dine at The Bar, decorated with 18th-century hunting theme paintings, lithographs and hunting trophies. Breakfast is served in The Promenade, a garden-style room with floor-to-ceiling windows and beautiful floral arrangements. Doubles start from $230 USD, depending on the season and availability. The hotel concierge can arrange a car transfer from the airport to the hotel. Plan a long weekend adventure at Lajitas Golf Resort and Spa, a 27,000-acre private estate nestled between Big Bend National Park and Big Bend State Park. The entire resort theme is inspired by the Old West. If you are looking for vacation spots in Texas where you can enjoy spectacular scenery, a great golf course, and rejuvenating spa treatments, Lajitas offers them all. Resort rooms, suites and villas offer guests a choice of a range of styles in four very different hotels. There are twenty-six individually decorated rooms at the Cavalry Post. Each room evokes a feeling of cowboy chic with cowhide rugs, rough-hewn saddles, and clawfoot tubs. La Cuesta's 12 guestrooms are ideal for families since several of the rooms can be made to adjoin a standard room with a double queen. The 16 junior suites in the Officers' Quarters are the most luxurious the resort has to offer. The patios and balconies of the Officers' Quarters overlook the Ambush Golf Course and Big Bend. The four restaurants at the vacation resort give guests plenty of different dining options for the duration of their vacation. Chef Jeff Blank offers fine dining at the Ocotillo Restaurant. Enjoy Southwestern dining and views of the golf course at the Candelilla Cafe. For a more casual atmosphere try the Thirsty Goat Saloon or the Trading Post Cafe. The Ambush is an 18-hole 7,042-yard (from the back tees) championship golf course that is every bit as unique as the rest of the resort. The course has four holes on an island in the Rio Grande, and hole 11A - a par one in Mexico. A golf vacation will give a lucky few the opportunity to make an international hole-in-one. Agavita Spa has three massage rooms, a facial room, a salon, and offers a wide range of treatments designed to make you look and feel good on vacation. Choose from a whole range of outdoor activities that allow you to be as active or as relaxed as you wish. 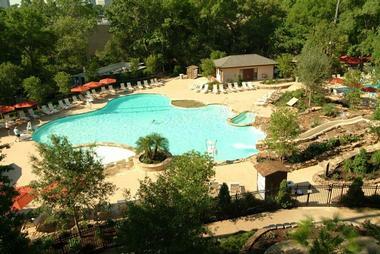 Texas vacation resort.There are up to five different resort activities offered every day. Swim in the pool, take a historical tour of the property, or rent a mountain bike and tour part of the 1 million acres of conservation land that surround the property. The resort is 450 miles from San Antonio, 600 miles from Dallas and 300 from El Paso. The fastest way to reach it is to fly into the private airfield right at the resort. Packages are available for around $480 per night an up. 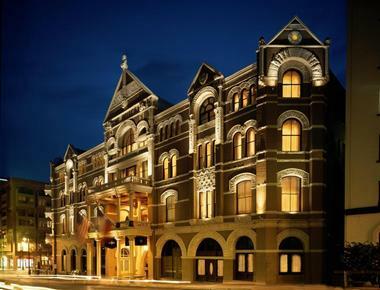 Centrally located in Austin, Texas, The Driskill Hotel was originally built in 1886. Today, this luxury property is favored by business travelers who enjoy its attentive service and everybody else who wants to take a step back in time to the Gilded Age. If you are planning a getaway to Austin, this is one of the best places to stay. The experience at the Driskill begins in its unique lobby which features a hand-painted ceiling, hand-laid marble floor and a custom-made stained glass dome. If you want to stay in one of the guest accommodations which are located within the original 1886 building, ask for one of the Historic Rooms when making your reservation. They feature beautiful Brazilian marble bathrooms, high ceilings and lavish fabrics. For those who like to stay active while traveling, the property offers a Fitness Studio with large windows, a choice of cardiovascular machines, and strength training equipment. 1886 Cafe & Bakery offers contemporary, Southern dining as well as homemade pastries and desserts. The four-diamond Driskill Grill serves a changing menu of innovative cuisine. Doubles start at USD $315 per night. Fun and stylish, the NYLO Dallas Southside is a trendy and eco-friendly lifestyle hotel that reflects Dallas’ passion for art, music and the environment. Old meets new in this city retreat where the building's historic character has been maintained to merge seamlessly with a new, contemporary design and modern amenities. Well-appointed guestrooms and suites are decorated in an industrial style with polished concrete floors, exposed brick walls, high ceilings and large windows offering spectacular city views. Local artists’ work adorns the walls, and deluxe facilities, such as complimentary wired and wireless Internet and signature NYLO NYTE beds add extra comfort. Guests can enjoy entertainment and fine dining right on their doorstep. Terrace Bistro & Bar is a favorite amongst locals who gather here for excellent cuisine in a industrial-Victorian setting, while the hotel's rooftop SODA Bar features a chic lounge area, outdoor pool and amazing views of the Dallas skyline. Rooms start at $157 per night. Located 10 minutes from downtown Houston, the Houstonian Hotel, Club & Spa is one of the top Texas resorts, situated on 18 calm wooded acres. Guest rooms and suites feature floor to ceiling windows, oversized working desks and fresh greenery. Rooms located on the Concierge Floor offer additional privacy, continental breakfast, evening hors d'oeuvres and cocktails in the Concierge Floor sitting room. The Health Club measures 175,000 square feet in size and comes with 30 personal trainers, exercise machines, swimming pool and a Youth Center for kids ages 6 weeks to 12 years. Among the numerous programs and classes offered are: boxing, martial arts, Yoga, rock climbing, basketball, tennis, squash and racquetball - plenty to choose from on your weekend getaway. The 17,000 square foot Trellis spa offers a range of treatments and services for men and women which incorporate products from the leading cosmetic lines. There are 21 treatment rooms including 12 rooms for body treatments, 7 facial rooms and a couples' room. The spa has an indoor float pool, a lounge with a fireplace and a quiet room for before and after treatments. The u-shaped Mediterranean-style spa building overlooks an inner courtyard with a garden. 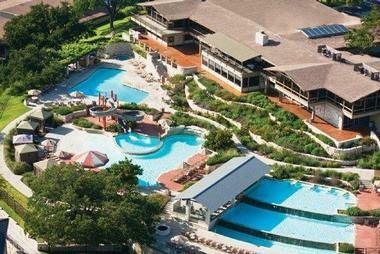 If you are looking for resorts in Texas with plenty to do on vacation, the Houstonian is a great choice. Rooms start at $162 per night. In the heart of the Texas Hill country, overlooking the tranquil Lake Travis, Lakeway Resort offers modern rustic refuge from the modern life with eight condos with two and three bedrooms and 168 rooms and suites. All rooms are beautifully decorated and feature private bathrooms, free Wi-Fi, high-definition TVs, fireplaces and fridges. Suites have private balconies and spacious sitting rooms with writing desks. Three inviting swimming pools, a well-equipped gym, a spa, a lobby bar and waterfront restaurant are there to make guests’ stay memorable. Flophouze Hotel is a quirky Round Top hotel crafted entirely from recycled shipping containers, offering six unique container suites decked out in sustainably-harvested wood furnishings, reclaimed timber, and upcycled decorations. The hotel, which is a project of architectural salvaging corporation Recycling the Past, is located on the site of the company's Round Top Ballroom event venue and offers communal guest amenities such as hammocks, fire pits, barbecue grills, and a Modpool crafted from a shipping container. Funky suites feature countertops made from repurposed bowling alley floors, cabinet bases from a Brooklyn laboratory, and one-of-a-kind vintage decor sourced from the Round Top Antiques Show. 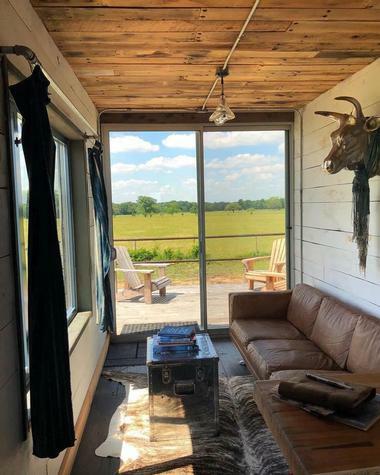 If guests fall in love with their accommodations during their stay, shipping container tiny homes are also available for purchase. 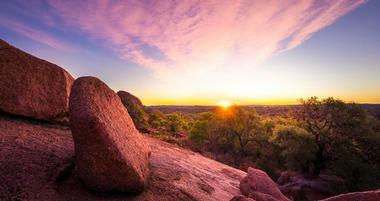 Vast, beautiful and diverse, Texas is the perfect place to live and explore. 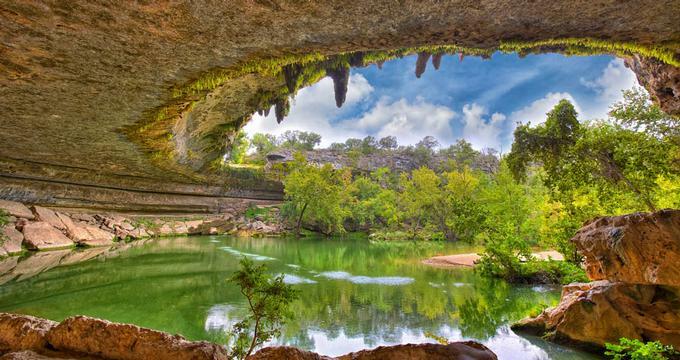 Whether you love beaches, hills full of blossoms or the wealth of activities that big cities offer, there are vacations in Texas for everyone. If you live in one of the major cities, we've already written about getaways from Houston, Dallas and Austin. Those who like to visit romantic castles and relax next to beautiful lakes also have plenty of Texas destinations to choose from. Below is a list resorts in Texas and other unique places to stay for couples and families. Texas is a diverse vacation destination, offering long vacations, mini vacations, quick getaways - there is something for everyone. Visit national parks, historic attractions, go shopping, relax at spas and on sandy beaches, go bird watching and play championship golf. There are many fun places to visit for families and couples alike, from luxury resorts to inexpensive inns. For cheap vacation ideas, look for last minute deals and packages near you so that you can drive to your destination and save money. Find more great Texas vacation ideas: Best Vacation Spots Near Dallas, TX. Spend an energizing Texas break enjoying some of the varied tourist attractions in Dallas. 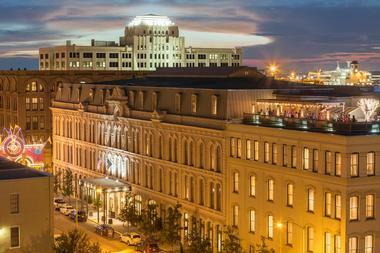 The city has something for everyone, including great outdoor areas, excellent museums and exciting visual arts. Families can have fun at the Perot Museum of Nature and Science where hands-on participation is encouraged, or can spend some time exploring the Texas Discovery Gardens, the aquarium and Reunion Tower. Art lovers will enjoy the Nasher Sculpture Center and Dallas Museum of Art, while music lovers may wish to visit the famous Dallas Symphony Orchestra. Visitors can Spend some outdoor time at Klyde Warren Park or visit one or more of the many excellent museums. For weekend and day trip ideas from Dallas, take a look at 20 Best Weekend Getaways from Dallas. Established in 1880 and operated by the City of Dallas, Fair Park in Dallas, Texas, features 300 acres of museums, exhibit facilities and park areas, including: An IMAX Theater; A planetarium; The Dallas Aquarium; The Cotton Bowl; An outdoor amphitheater; Music Hall at Fair Park featuring Broadway shows, ballet and opera. The park hosts over 100 special events and cultural festivals each year. The Nasher Sculpture Center in Dallas is housed in a 55,000-square-foot building and two-acre sculpture garden is a unique establishment devoted to modern sculpture. The Nasher Collection is comprised of more than 300 sculptures by 20th-century artists, including Joan Miro, Alexander Calder, Isamu Noguchi, Henry Moore, Barbara Hepworth and numerous other artists. It is one of the most impressive modern sculpture collections in the world. Occupying one city block in the Dallas Arts District, the Nasher Sculpture Center features five pavilions with end walls made of clear glass overlooking the garden. The sculpture garden features 20 larger sculptures from the Nasher Collection, rotated periodically. Visitors can stroll through the garden past the sculptures surrounded by ponds, stone walls, trees and small meadows. The Center has a cafe and a bookshop. Since Dallas has more shopping centers than any other major city in the nation, many travelers going on a Texas vacation make a stop in the city for a day of shopping, museums and entertainment. From international designer boutiques to outlets, affordable finds and Texas chic, there are many choices. Galleria Dallas features 200 famous brands such as Tiffany & Co, Versace, Gucci and Louis Vuitton. Here you will also find the Flagship Dallas locations of Macy's, Saks Fifth Avenue and Nordstrom. Tired of shopping? Ice skate under a vaulted skylight inspired by the Galleria Vittorio Emanuele in Milan Italy. In addition to boutiques and restaurants, NorthPark Center features 20th century art and splendid architecture. Stores include Neiman Marcus, Burberry, Kate Spade, Faconnable and Stuart Weitzman. If you do not have a car, this shopping center offers a complimentary shuttle to and from the DART/Park Lane Light Rail. Also read: 15 Best Lunch & Dessert Spots in Dallas. There is wide selection of daily flights to Dallas/Fort Worth from major U.S. and some international cities. Airlines flying to Dallas include Air Canada, AirTran Airways, Alaska Airlines, America West, American Airlines, British Airways, Continental Airlines, Delta Air Lines, Frontier Airlines, Lufthansa, Midwest Airlines, Northwest Airlines, Spirit Airlines, United Airlines, US Airways, and others. For a complete list of flights, visit the Dallas/Fort Worth Airport web site at www.dfwairport.com. Get ready for romance as you plan a weekend getaway to Houston where a great variety of romantic attractions await you. For something really different head to the James Turrell Twilight Epiphany Skyspace to experience the light and music show at sunrise and sunset, then head to the iFly indoor Skydiving center to defy the effects of gravity. For art lovers, there are many attractions including Rienzi at the Museum of Fine Art, the Hobby Center for Performing Arts and the Bayou Bend Collection. Admire the Mother Nature’s art at the Cockrell Butterfly Center and the Houston Arboretum, before satisfying your inner Foodie with a Houston Culinary Tour. Houston has many great things to do with kids as well. If you are looking for day trips and weekend ideas from Houston, take a look at 27 Best Romantic Weekend Getaways from Houston. The Houston Airport System consists of the following airports: George Bush Intercontinental, William P. Hobby and Ellington Field. The highest number of flights to Houston (domestic and international) land at George Bush Intercontinental. Airlines that fly to Houston include AeroMexico, Air Canada, Air France, America West, American Airlines, British Airways, China Airlines, Delta Air Lines, Frontier Airlines, Lufthansa, Northwest Airlines, United Airlines, USAirways, and others. Several charter airlines also offer flights to Houston. For more information about flights to Houston visit the Houston Airport System web site at www.fly2houston.com. More vacation ideas: 27 Best Romantic Weekend Getaways from Houston. 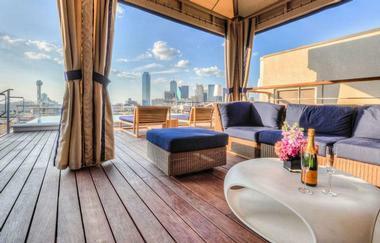 Arlington, Texas is a bustling city offering varied visitor attractions, with an emphasis on sports. The Planetarium is one of the best in the country and the sound and light shows are both educational and sensational. Sports are well represented and you can tour the AT&T Stadium, visit the Bowling Museum or take in a game at Globe Life Park or College Park Center. Music lovers can visit the Levitt Pavilion for Performing Arts and the Arlington Museum of Art showcases visual arts. Enjoy a round at the lush Tierra Verde Golf Course, or go walking, hiking or picnicking at River Legacy Park. A weekend or short break in vibrant Fort Worth has something to offer for everyone, including families. Choose to spend your time outdoors in Texas’ oldest botanical garden, Fort Worth Botanic Garden, which includes a wonderful Japanese Garden complete with ponds, bridges and waterfalls, or opt to visit a couple of the city’s fine art museums featuring modern, contemporary and classic artworks. The interesting Stockyards National Historic District pays tribute to the livestock industry in Texas, while lively Sundance Square is the place to go for shopping, dining and entertainment. Families will have fun at the Museum of Science and History and the Fort Worth Zoo. Lovely San Antonio sprang up around the UNESCO World Heritage Site of the Spanish Mission that was established there in 1691, and offers non-stop entertainment for visitors. Many visitors start their exploration at the San Antonio River Walk which winds its way through the city, culminating in Museum Reach from which you can access the Museum of Art and the Pearl Brewery complex. San Antonio Cruises operates a water taxi 39 stops along River Walk. The San Antonio Missions are a must-see attraction and the famous Alamo complex is equally fascinating. In addition, the city boasts a zoo, a botanical garden, many great romantic restaurants, a museum for kids and Sea World, San Antonio. Fiesta San Antonio, a colorful event that celebrates spring and the cultural heritage of San Antonio, usually takes place in the third week of April. Each year, the Fiesta attracts over 3 million people. The 11-day celebration includes parades, receptions, parties, concerts and conferences. There will be over 100 events throughout the city. If you've been waiting for an excuse to visit San Antonio, this is the perfect occasion. Plan a quick weekend getaway at the end of April to take part of the festivities. You will be able to attend 11 different parades, taste excellent food, listen to music and go dancing. Kids will have fun trying different arts and crafts and watching athletic events. Each event is sponsored by a local nonprofit organization. All the proceeds from the volunteer-run events benefit nonprofit organizations, so you know that your money is going towards a good cause. The San Antonio tourism board has a list of events as well as hotels offering specials and packages during the Fiesta. While the event is not as famous as the Mardi Gras in New Orleans, it is one of the most loved celebrations in Texas. Situated just 30 minutes from Dallas, Plano is a great choice for a weekend escape. Historic Downtown Plano, home to many gracious old buildings, stages festivals and events throughout the year. For nature lovers there are walking and hiking trails in Oak Point Park and Arbor Hills Nature Preserve. The whole family will enjoy the Interurban Railway Museum and Heritage Farmstead Museum. For shopping, dining and entertainment head to The Shops at Legacy, a lovely tree-lined outdoor shopping center. Pinstack is a huge 28 lane bowling alley for bowling enthusiasts. If you visit in September you can see the Plano Balloon Festival. If you are planning to visit the Gulf Coast, the Corpus Christi area offers over 100 miles of beaches, including the beautiful Padre and Mustang islands. Known as the host of the U.S. Open Windsurfing Regatta and attractions such as the U.S.S. Lexington and the Texas State Aquarium, the area is connected to Padre Island. The city has a population of around 277,000 and is located in the middle of the Gulf Coast. The U.S.S. Lexington was used to film a part of the movie Pearl Harbor, starring Ben Affleck, Josh Hartnett and Alec Baldwin. Port Aransas, located on Mustang Island, offers beautiful beaches, horseback riding and exceptional bird watching along the Great Texas Coastal Birding Trail. Find more information call the local Convention & Visitors Bureau at 800-766-BEACH. South Padre Island is a great destination for bird watchers. The island attracts over 300 species of birds throughout the year. During the fall, birds head south for the winter - they land to rest and feed on the Gulf Coast. On their return journey in the spring, they also visit the island. One of the best places for bird watching is the South Padre Island Convention Centre and the adjacent Laguna Madre Nature Trail. The trail, comprised of a boardwalk, crosses four acres of wetlands where one can spot egrets, herons, pelicans, oystercatchers, terns and the White-Morph Reddish Egret. Anyone planning a Texas vacation should pack a pair of binoculars, especially when visiting the Gulf Coast. The Great Texas Coastal Birding Trail, completed in 2000, links 308 wildlife-viewing sites along the coast. The trail winds through 43 Texas counties and features board walks, parking, kiosks, observation platforms and landscaping. The best way to navigate the trail is by using the Trail Map distributed by Texas Parks and Wildlife. Each site on the Trail is marked with a unique sign and site number which can be identified on the map. Each section of the trail (upper, central, and lower coast) has a separate map which can be purchased for $3 each by calling 888-900-2577. You can also view maps online for free at www.tpwd.state.tx.us. Maps include information about the best time to go, birds, food and nearby lodging. The south Texas beaches of Corpus Christi are possibly the main attraction of the town with warm waters which entice swimming and surfing. Fishing is great from the Bob Hall Pier and the area is renowned for fantastic bird watching at several venues including Padre Island National Seashore, home of many rare birds and other marine creatures. Other outdoor activities include horseback riding on the beach or a walk through the Botanical gardens. For families the Texas State Aquarium offers marine shows, the Corpus Christi Museum of Science and History has interactive exhibits and the USS Lexington is now a floating museum., There are two great art centers for art lovers. Austin’s reputation for great sunny weather attracts many visitors who come to enjoy a variety of outdoor activities, including boating or walking, hiking or cycling the Boardwalk Trail at Lady Bird Lake. Zilker Metropolitan Park includes a botanical garden, sculpture garden and a wonderful spring-fed natural swimming pool. The selection of museums includes Bullock State History Museum, which brings the history of Texas to life and includes an IMAX theater, and the Blanton Museum of Art showcasing the visual arts. Round off your visit with a great meal at one of the many restaurants and see a show at the historic ZACH Theatre. For weekend and day trip ideas from Asutin, take a look at 25 Best Romantic Weekend Getaways from Austin, Texas. Start your weekend in El Paso by riding the Wyler Aerial Tramway up to the summit of Ranger Peak for wonderful views. For nature trails with a difference visit the Hueco Tanks State Park and Historic Site or go hiking in the Franklin Mountains State Park. Museums for the whole family include the El Paso Museum of History, the Insights Science Museum, the Centennial Museum and the Fort Bliss US Army Museum. The Plaza Theater and the Museum of Art will appeal to your cultural side, the shopping is great at the Downtown Art and Farmers Market and a walk in the Rose Garden is positively up-lifting. Galveston has all the ingredients for a perfect weekend by the sea. Seawall Urban Park offers beach-side entertainment at its best, competing with Schlitterbahn Galveston Island Waterpark for a splashing good time. The Strand Historic District’s beautiful Victorian buildings now house shops, restaurants and museums such as the Galveston Island Railroad Museum and the Offshore Energy Center Museum. Explore the decks of tall ship ELISSA (1877), tour the opulent Bishop’s Palace or take the kids to the Ocean Star Drilling Rig Museum and the Lone Star Flight Museum. You can tour Moody Mansion, visit a spa or hike and picnic in Galveston Island State Park.